Welcome to the world of Silhouette Shingles! We offer a variety of products and options for incorporating custom designs into cedar shingle siding, to enhance the beauty and value of your home or business. Artist Paul Paquette has been crafting his art for over 30 years. Designs incorporate wildlife and nature and range from a single item, to large murals, to designs that fully encompass a building. Using red, and yellow Certi #1 cedar shingles, and incorporating stains when appropriate, your design options are virtually unlimited. 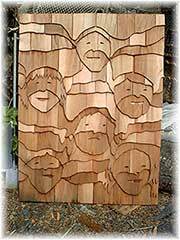 We offer custom, unique and artistic cedar shingle patterns and panels, workshops on creating silhouette shingle art and an unlimited variety of cedar shingle siding designs. 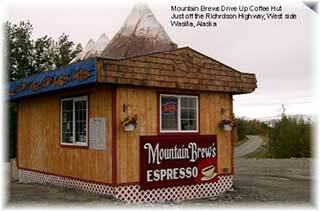 Large designs, such as this, require on-site installation. 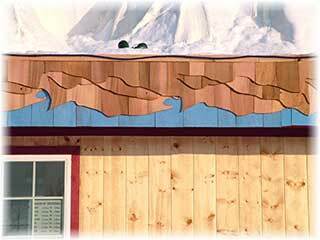 Panels are designed and constructed by Paul Paquette in his studio on Lowell Point in Seward, Alaska. 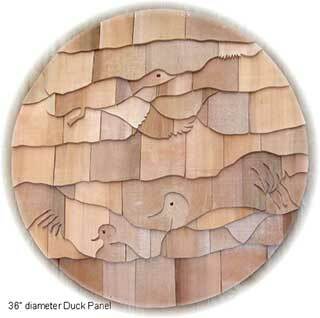 Silhouette Shingle panels (up to 36″ square, oval, or round) can be delivered or shipped. Hung, or integrated into a larger area by Paul, or a trained carpenter. 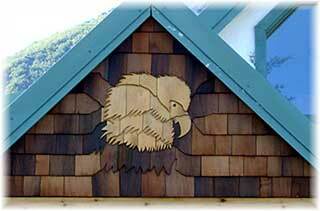 Patterns can be used by a trained installer to give a unique and personal touch to any cedar shingle siding project, from a gable end to an entire building.. 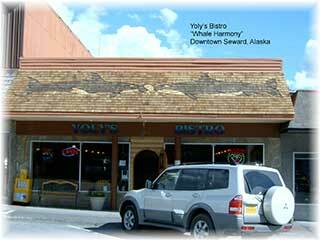 The Ranting Raven’s storefront, a bakery and gift shop just north of Yoly’s Bistro in Seward, Alaska, incorporates mural designs of ravens with geometric patterns on the overhang and sides of entrance. 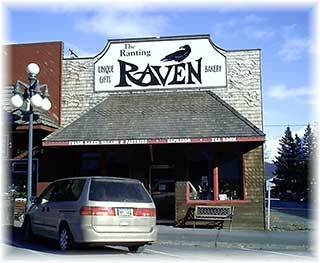 Visit our Photo Gallery pages for close up photos of the raven designs seen here.